We ended 2018 with a bang when we welcomed superstars Tatum Rice, Crey Zee and Hashtags to the studio! Tatum had just maneuvered the beautiful mare Crey Zee to the NCHA Open World Futurity Championship. Hashtags, the beautiful blue roan stallion joined us for his second session in the studio to celebrate the end of an exceptional year full of show-stoping runs, and the clinching of the 2018 Open World Championship. Here are a few favorites from our session! Female role models have been in the back of my mind for some time now. Perhaps this has to do with the rise of women's movements and today's political climate. There is also the growing sense of community I am developing amongst my own gender. In my very short time as an adult, I have sensed a shift. Women's' collective voice is growing louder; with that come stories of women who have broken the glass ceiling, who have been pioneers in their industries, who have displayed incredible strength and determination to accomplish their feats. For me, this shift is about celebrating the women we choose as role models: from the mothers and sisters and friends to the Harriet Tubmans, Virginia Woolfes, Robyn Davidsons and Ruth Bader Ginsburgs of this world. 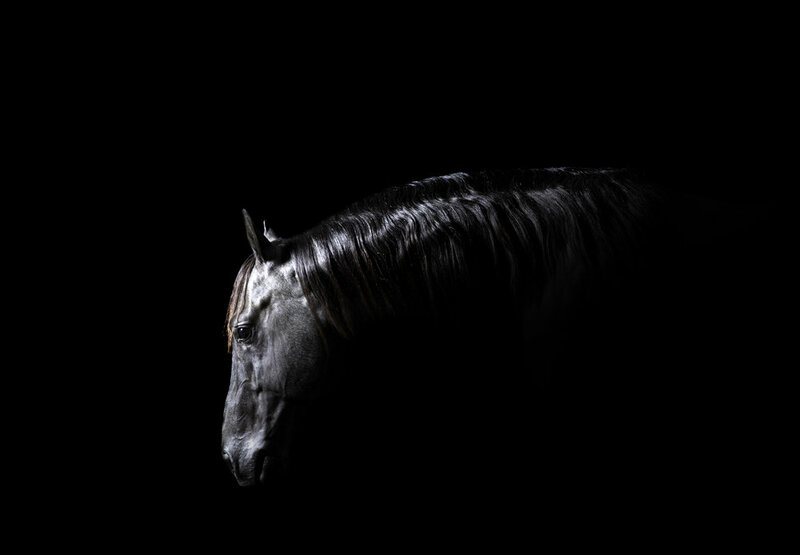 One of my recent studio sessions was with a trail blazer in our very own Cutting Horse industry. Lindy Burch is the first woman to have won the Reserve Championship in the NCHA Cutting Horse Futurity in 1979 and the following year, the first woman to win the NCHA Futurity. Among many other accomplishments, in 1998 she set a record by marking a historic 233 at the NCHA World Finals on board Bet Yer Blue Boons. The now 29 year old legendary mare also joined us in the studio and Lindy could not resist getting on her for a couple shots. Lindy has been helping me in the show pen ever since I started riding in the US. May all young women have strong peers to look to for inspiration, motivation and strength. Cutting horse mare Carolena Moon (aka Cassie) and her money making daughter, Carolina Reyn (aka Lucy) come to the studio for a portrait session. We are lucky if we get to experience a truly great cutting horse. It's even sweeter when that horse is home bred. Megan Miller wanted a session with her two special girls so we created a few treasures she would have forever! Here are a few impressions from the first branding I attended outside Foley, Colorado. As I watched three generations work together to care for their land and livestock, I came away from the branding with a new appreciation for ranching and the western lifestyle. Ranching is about family, community, and hard work. Friends and neighbors come from far away places to lend a hand. Kids learn responsibility by undertaking various tasks that must be done during the organized chaos that is a branding: ear tagging, vaccinating, and roping and dragging and flanking for the older kids. The hours are long and the weather elements are harsh, but whatever it takes to get the job done. On a more personal note, I expanded my vocabulary while I was there - I learned what a bedroll is and how to use it. And I reached a personal cowgirl milestone when I switched out my SD cards while at a blazing fast (or at least it felt that way) lope in an effort to catch up with the group. The ranch horse I was lent, Sayhey Rey the Bay, was an excellent dodger of cactus, and it's fair to say that I now trust him with my life. At 5:30 am, the sun is still lurking below the horizon as I walk into the dining room of the main house at the legendary 6666 Ranch. Some cowboys are moving about getting their breakfast plates; others are seated quietly sipping coffee from plain white mugs. They sit bare-headed, their hats lined up on the oversize rock windowsill in the hallway. The hats are a testament to their work on the range-not the clean, perfectly creased kind I wear in the show pen. These hats have lived and been weathered by the elements. Sun, sweat and occasionally rain have given them an identity which is partly that of their owner… For the rest they just stand on their own, symbols of an endangered way of life. A few more cowboys roll in, preceded by the clinking of their spurs on the flagstone floor. The ranch cook serves warm scrambled eggs and tortillas. Before long, the men are heading back to the main barn where they saddle their horses for the day of work ahead. They will be gathering 600 head of cattle in one of the larger sections of the ranch this morning. The section spans a mere 15,000 acres. Once the herd is assembled two days of branding will ensue. A few industrial lights hang high in the short barn alley. The iconic red barn that many know from the 1960’s Marlboro ads is stamped with the famous 6666 brand; the same brand that adorned the 100 head of cattle that Samuel “Burk” Burnett bought when he started the ranch in 1868. 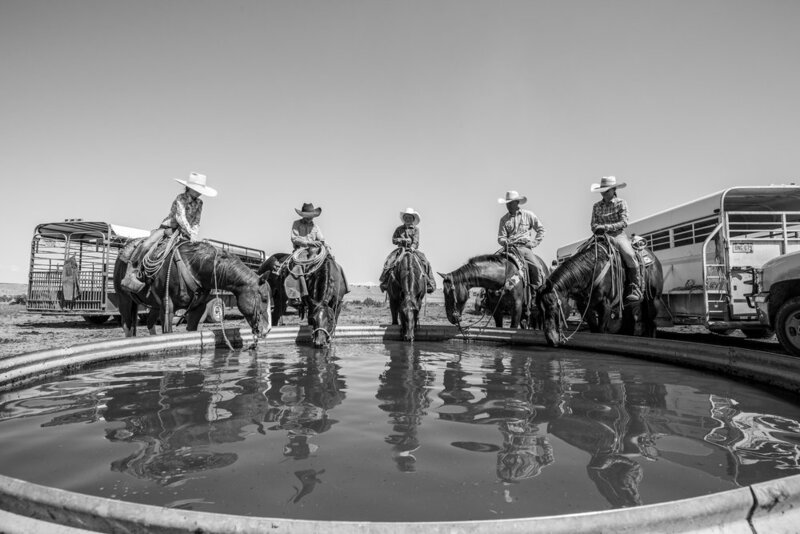 In front of the barn, four cowboys await their mounts. The horses are ready and the men chat while one of them lights a smoke. Another adjusts his chaps. They are the last of the cowboys to load their horses and set off. They will gather cattle for most of the morning, possibly into early afternoon. As the trucks and stock trailers pull out, the ranch goes silent again. Over the next couple of days, a film crew will be shooting various ranch activities and interviewing the resident horse trainer, the vet, and others. It will all fit into a larger project: the creation of a documentary about cutting, the origins of the sport and its roots in ranching. The 6666 is just one of the stops along the way and several other historically significant ranches will be featured. By now the sun is hitting us hard, I join the film crew at the breeding barns and vet clinic. There, people are busy and things are in full swing. In the vet clinic, ''brand new babies” are being brought in for their dose of plasma. It will increase their antibody levels and help their overall health and immunity. Others are seeing the dentist or getting their feet trimmed. One side of the vet clinic opens up to a network of traps, catch pens and alleyways that extend almost as far as the eye can see. Beyond it, acres and acres of pasture. Two cowboys, Phil and Curly and a black dog are responsible for funneling horses through the alley ways to the vet clinic and back to the pastures after. They gather mares in large numbers throughout the day, a process they call “punching mares”. The mares come barreling through the alley into one of the catch pens, led by the black dog, kicking up an amazing amount of dust along the way. It has not rained in 200 days, Curly tells me as he reaches into his pocket and pulls out his chap stick while closing one of the gates. Phil reaches over the top of his saddle to give his horse a treat he has picked up from a feeder, then readjusts his bridle. This documentary wouldn't be complete without the presence of a cutting horse legend and true cowboy at its center. Buster Welch, who just turned 90, observes the camera crew set up their gear and prepare for their last interview of the day. This is an interview Buster was particularly interested in attending and he sits quietly as he listens to the head vet, Dr. Blodgett discuss the various facets of the 6666's successful breeding program. At one time, the 6666 employed Buster to break colts and when talking to him, it is apparent that this is a point of pride. He was barely 16, starting out on the path of becoming one of the world's greatest horsemen. A couple of weeks ago, we got back from an incredible adventure in Tanzania. Even though these aren't horse related, I wanted to use the blog as a platform to share some photos and stories from our trip, as I suspect that some of you animal lovers may still appreciate them. Most of the wildlife shots are digital and the rest were shot on film. I bought my first film camera right before this trip, a Nikon F100, and couldn't wait to try it out! Something about shooting on film is so appealing to me. I find myself putting more thought into each frame and really enjoying the process. I can't wait to experiment some more! We watched this couple mate as the male's brother waited nearby. Amongst lions, brothers will form coalitions and share their mates, taking turns copulating. Females are slow reproducers and need to copulate up to 3000 times to produce a litter. The brother(s) will stay close to the couple until the male gets tired and cedes his spot to another. Maasai women welcome us into their camp. Maasai men performing their traditional Dancing competition called the "adumu". Maasai women sitting in front of their house. In Maasai culture, it is the women who are in charge of building the houses. Due to the fact that the Maasai are nomadic, their homes are built to be temporary. They are built form timber, smaller branches, and mixtures of mud, cow dung and human urine. Portrait of a Maasai woman. Though they traditionally dressed in animal skins, today, typical Maasai dress consists of red or blue sheets (Shuka), wrapped around the body. Both men and women wear beaded jewelry placed around the neck and arms that vary in color depending on the occasion. We came across these young Maasai boys on our way out of the Ngorongoro crater. Their dress and white painted faces indicate their initiation into manhood. The white paint helps repel evil spirits. The warrior is of great importance and a source of pride in the Maasai culture. To be a Maasai is to be born into one of the world's last great warrior cultures. From boyhood to adulthood, young Maasai boys begin to learn the responsibilities of being a man and a warrior. The role of a warrior is to protect their animals from human and animal predators and to provide security to their families. Through rituals and ceremonies, including circumcision, Maasai boys are guided and mentored by their fathers and other elders on how to become a warrior. Although they still live their carefree lives as boys - raiding cattle, chasing young girls, and game hunting - a Maasai boy must also learn all of the cultural practices, customary laws and responsibilities he'll require as an elder. Our tent at the Maweninga Camp, Tarangire. Our guide, Nelson showing us our route. This winter I was fortunate enough to meet Dan James from Double Dan Horsemanship, the great clinician and horse trainer. 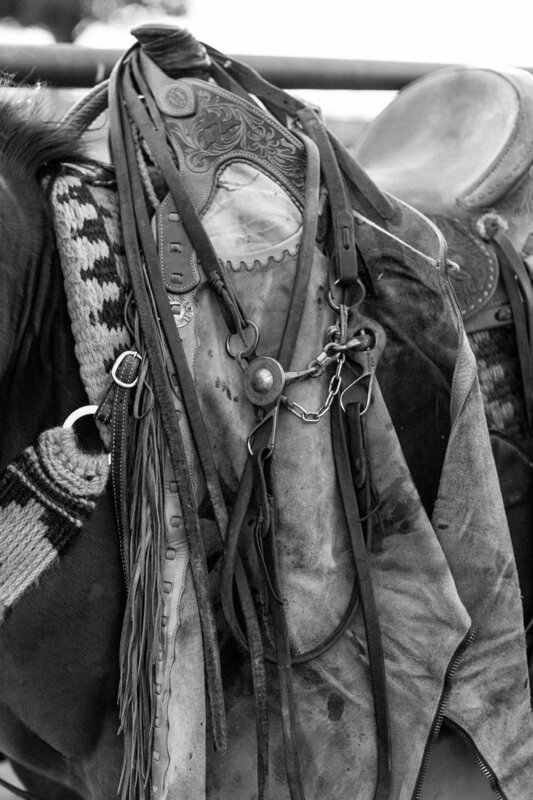 He notably trains "trick horses" and several of his horses have been in movies and fashion shoots. "Vegemite" the palomino stallion, pictured here has never had a bad hair day in his life. I am somewhat partial to palominos, as my first horse was a gorgeous apricot palomino mare. Shortly after I met Vegemite, Dan and Vegemite showed in the NRHA Freestyle reining in Oklahoma City and put on quite the performance. Here are a couple of shots from our session. He is a handsome devil! 2017 is almost over and I'm finishing up the very last session of the year. Here are a few photos from my shoot with Ryann Packard, 2017 NCHA Youth World Champion, and the three mounts who helped her win the gold buckle! Here she is, pictured with "Sir Stylish Lizzy" (aka Nickel), "Im Catman" (aka Catman) and "Playin in Jewels" (aka PJ). I can't think of a better way to memorialize such a fantastic year in the show pen! As I reflect on this year, I would like to express how thankful I am for the many opportunities I have been given. 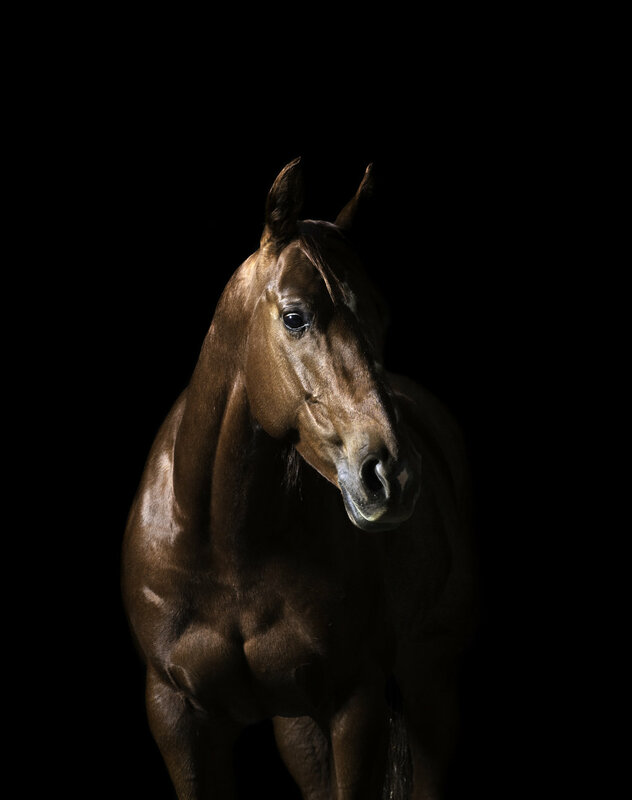 I really appreciate the various ways people have shown support--whether through purchasing my work, coming to see my exhibition, hiring me to create portraits of your special horses, or spreading kind words and comments on my photography. Can't wait to see what 2018 has in store for us. Last week felt like christmas in the studio! 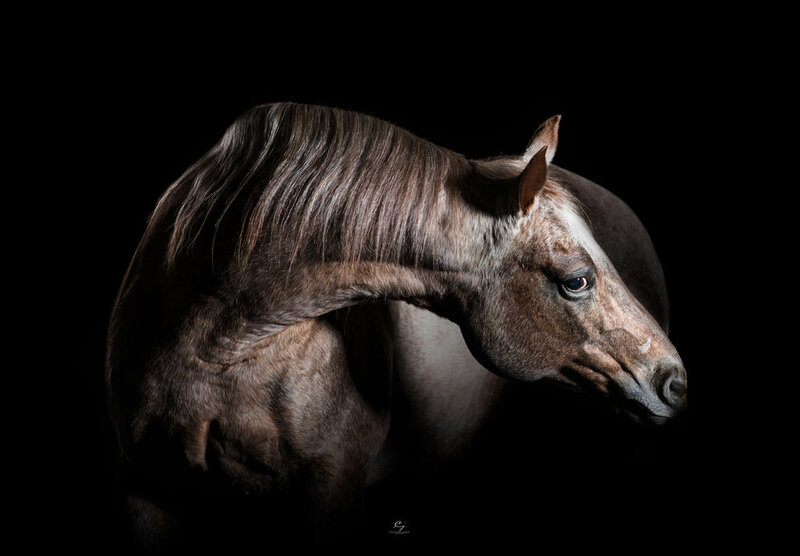 I got to photograph this gorgeous sorrel mare and blue roan stallion who on top of being famous Cutting Horses and great athletes, were also perfect models. Eazee E was quite the poser and she has good reason to show off. She had just finished competing in the World Finals of Cutting in Fort Worth and was the 2017 NCHA Open Reserve World Champion with over $120k in earnings for the year! Check out her muscular stature and alert eye. Hashtags, in true stud fashion was a far more curious model. 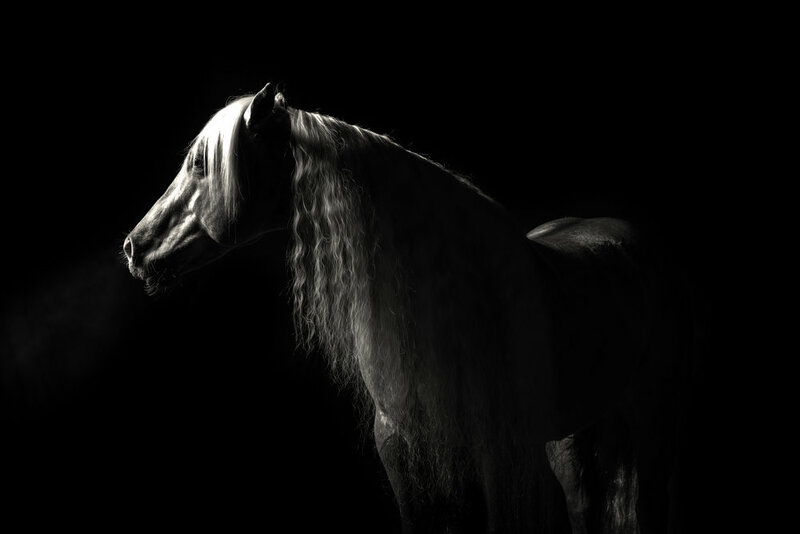 He enjoyed wandering around the studio in an effort to catch a whiff of past horses there before him. But we managed to keep him contained and get some exceptional shots. 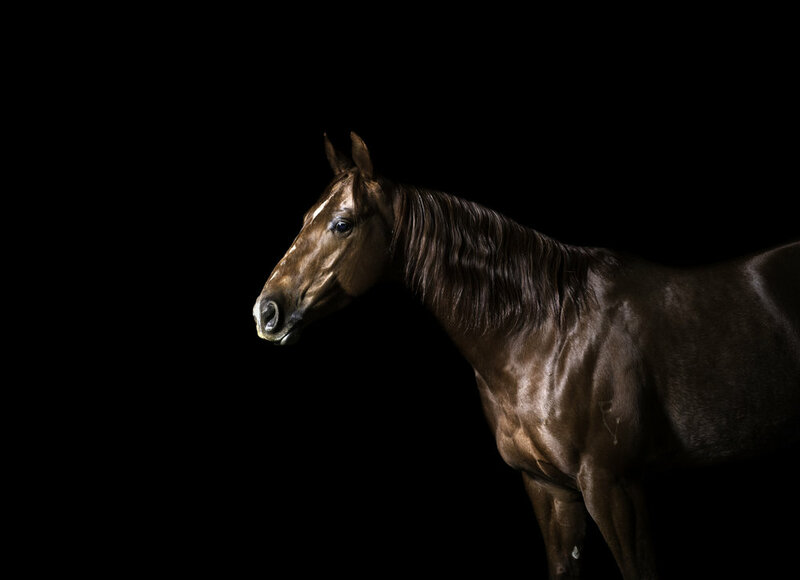 He is quite the looker and one of my favorite horses I've photographed to this date! Look out for the Jan-Feb 2018 Issue of America's Horse! You will find an article by Julie Bryant and some behind the scenes photos of the studio process while I photograph metallic Cat and Spots Hot. And "Adonis", currently exhibited at the Cowgirl Museum in Fort Worth through February, made the cover! A Studio Session with 2016 Non Pro World Champion, Lily. Last week we had the pleasure of welcoming Light N Lily, aka Lily into the studio! This gorgeous 7 year old cutting horse mare is not only last year's Non Pro World Championship, but also a love to be around. She certainly does well in the spot light! 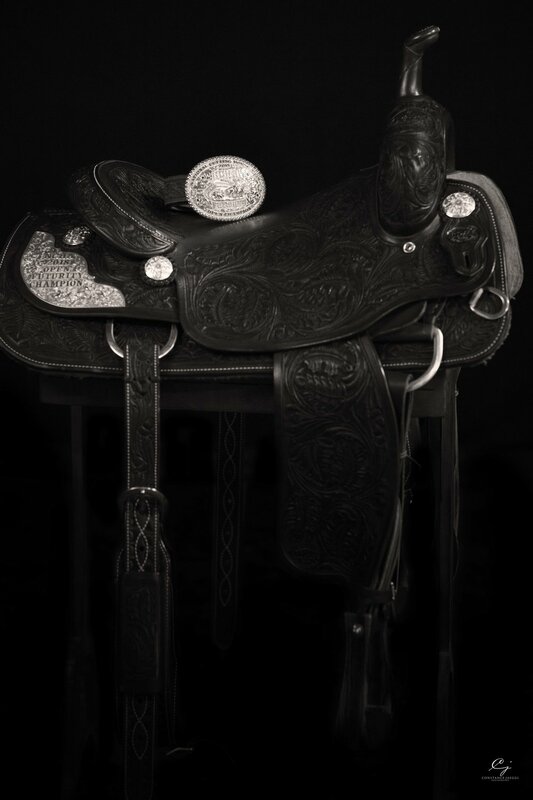 We were able to incorporate her Champion Trophy saddle and buckle which she proudly showed off. Check out a few of my picks from our session! I am very excited to share a few of my top picks from my most recent commission! 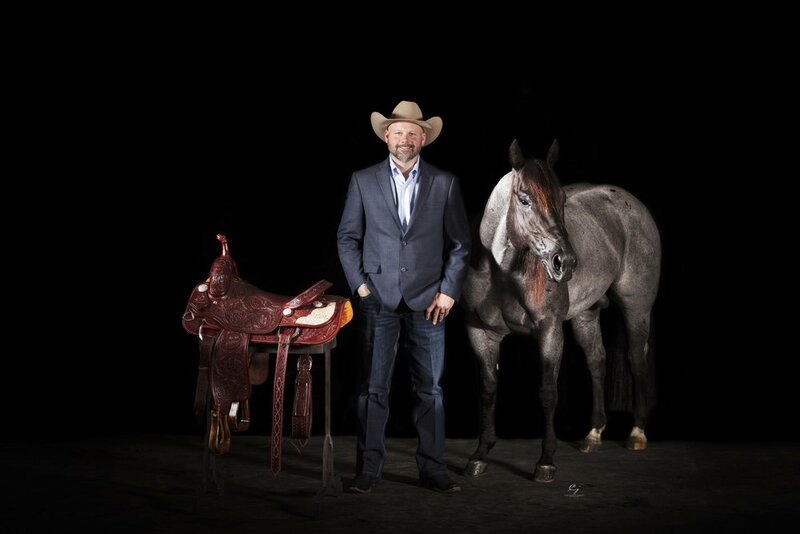 Last week, I was lucky enough to welcome two famous cutting horse stallions to the studio. Metallic Cat has sired over 16 million dollars in offspring while Spots Hot has sired over 4 million. They are both owned by the Rockin P Ranch. Quite an honor to be in the presence of these two powerhouses, and to be hired for their portraits! Julie Bryant from AQHA's Americas Horse Magazine assisted the shoot and took a few behind the scenes shots. Stay tuned for her article which will be published in next month's issue!